Smoking tobacco emerged from religious ceremonies in the Americas and was probably initially restricted to only shamans, priests, and medicine men. Both in ancient America and in sixteenth-century Europe, “holy smoke” from tobacco was thought to help cure illness and drive out evil spirits. Ramon Pane, a monk who accompanied Christopher Columbus to the Americas, is usually credited with introducing tobacco to Europe. In ancient America, tobacco was chewed, drunk as tea, inhaled as a powder-like snuff, and consumed as a jelly—but smoking tobacco was by far the most popular. The Peruvian Aguaruna aboriginals would make hallucinogenic enemas using tobacco. Smoking tobacco was thought to cure syphilis in the mid-sixteenth century in Europe. Claims for the benefits of smoking in sixteenth-century England rested in large part on Galen’s (A.D. 129-200) theory of the four humors, which asserted that the body was composed of hot, cold, wet, and dry humors. Smoking was understood to heat and dry the body to a state of manly vigor. Sir Walter Raleigh took his pipe with him to the scaffold when he was beheaded in 1618. Urea, a chemical compound found in urine, is added to cigarettes for extra flavor. European traders introduced tobacco to Asia and India by the mid-seventeenth century. In these countries, tobacco was often mixed with other leaves and spices and then smoked through a water pipe known as a hookah. The smoke was cooled, giving considerable relief in the hot climate. Sugar and cocoa are often added to cigarettes, a fact many diabetic smokers are unaware of. According to an ancient Huron Indian myth, a woman was sent by the Great Spirit to save humanity from starvation. Potatoes grew where her right hand touched, and corn grew under her left hand. After she made the Earth fertile, she rested, and tobacco grew where she rested. The Chongzhen emperor (1627-44) in China warned that “common people who smoked would be punished like traitors,” and in 1634 the Patriarch of Moscow warned that both men and women who smoked would have their nostrils slit or would have the skin whipped off their backs. Renaissance author Ben Jonson argued that smoking was the "devil’s fart." Pierre de Lancre (1553-1631), an educated French magistrate and influential demonologist, argued that smoking tobacco directly linked accused witches in Europe with the “diabolical” Indians in the Old World. For Lancre and several other witch hunters, tobacco was seen as inversion of the Christian sacrament. The Aztecs regarded tobacco as the incarnation of the goddess Cihuacoatl whose body, they believed, was composed of tobacco. Tobacco gourds and pouches were seen as symbols of divinity. Only recently, and mainly in Western countries, has smoking been seen as a serious health hazard. Smoking rates in the United States have dropped by half since 1965, from 42% to 26% of adults. Smoking in developing countries, however, is rising. Cigarettes are the most traded item in the world. Kentucky has the highest rate of smokers (28.7%) in the U.S., while Utah (11.5%) has the lowest. Currently, over 5.5 trillion cigarettes are produced globally per year. Cigarettes are an attractive source of government revenue because so many people smoke them. The cigarette and cigar are recognized phallic symbols, and several Internet sites are devoted to smoking fetishisms.c Ironically, smoking has been directly linked to sexual impotence. Women in the United States increasingly began smoking publicly in the 1920s when the cigarette was adopted by advertisers as a symbol of equality, rebellion, and women’s independence.k Currently, cigarette smoking kills an estimated 178,030 women in the United States annually. Pregnant women who smoke are more likely to deliver not only low birth weight babies but also highly aggressive children. A British survey found that nearly 99% of women did not know the link between smoking and cervical cancer. In the United States, over 3,000 deaths from lung cancer in nonsmokers are due to secondhand smoke. Of the thousands of chemical agents in tobacco smoke, more than 50 have been proven to cause cancer. Within 20 minutes of quitting smoking, a person’s blood pressure returns to normal. Within one year, the chance of suffering a heart attack decreases by half. Tobacco smoking, particularly cigarette smoking, is the single-most preventable cause of the death in the United States. Ambergris (whale vomit) has been added to cigarettes for flavor. In early Hollywood, directors used cigarette smoke to add atmosphere, mystery, and sensuousness to their films.c Tobacco firms also paid Hollywood to place cigarette products in popular movies in the 1930s, 40s, and 50s. 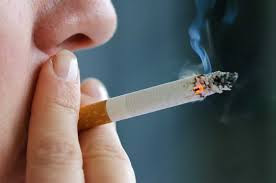 Though some cigarettes are made with lower tar and nicotine contents, smokers usually inhale them more deeply to get the same buzz as with regular cigarettes. The Anti-Cigarette League of America tried to convince both children and adults not to smoke and tried to exert lobbying pressure on state and national legislation against smoking cigarettes. The League lasted only a few years (1919-1927). Anti-cigarette activist and automaker Henry Ford popularized the term “The Little White Slaver” in reference to the cigarette in the early twentieth century. Both Henry Ford and Thomas A. Edison objected to cigarettes and refused to hire anyone who smoked them, on or off the job. Because so many soldiers smoked cigarettes, WWI helped legitimate cigarettes by linking them to an icon of manliness and civic virtue. During WWI, Americans were asked to send cigarettes to soldiers as part of the war effort. During WWII, cigarettes were part of soldiers' rations. French anthropologist and ethnologist Claude Levi-Strauss argues that people smoking tobacco together reinforces personal relationships and often serves as a type of social initiation.